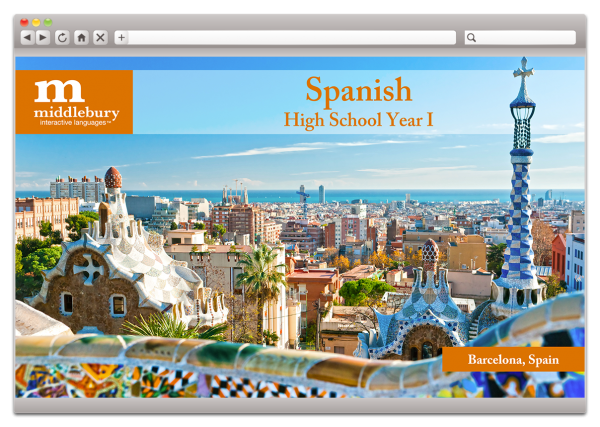 Last year we had the opportunity to review the first semester of High School Spanish I, Grades9-12 from Middlebury Interactive Languages. This year we received High School Spanish I, Grades 9-12 second semester. Middlebury Interactive Languages offer foreign language courses for Spanish, French, Chinese, and German. There are courses available for grades K-12 and they can be purchased with or without a teacher. You will have access to your course for one year. The Middlebury High School Courses are based on the immersion methodology. They develop proficiency in reading, writing, listening and speaking skills through video and activities. The videos are filmed on location with authentic content. Students are able to move at their own pace to learn the language and discover new cultures. The language is applied in common situations that the students understand. Students are engaged in learning by participating in conversations that introduce vocabulary, grammar, and sentence structure. When you start your course you have the option of following the daily calendar or you can select your lesson from the table of contents. You can also access the gradebook to see how your student is progressing. The Gradebook shows the score of each assignment, quiz, and test. You can also see the date it was completed and a due date if you are following the calendar. The High School Spanish I semester 2 is divided into 18 Units with five lessons in each. Once a lesson is completed a green check mark will appear next to it in the table of contents. Each unit is on one topic such as the home, the body, clothing, and more. Plus you learn grammar along with the lessons. There are paragraphs to read and answer questions about it, audio to listen to, vocabulary to learn, and speaking labs. Delaney has been using this program by herself which is a good thing since I have never learned Spanish and can only recognize a few words. She loves using it & she has actually been using more Spanish throughout the day since she started. Amber knows a little Spanish, so Delaney would read her lesson to her and they would try to carry on conversations. There are a list of vocabulary words for each Unit and Delaney has been writing them down in her vocabulary notebook for easy reference. Not only is she learning Spanish, but she is loving the culture she is learning with it. This is what she has to say about it: I love Middlebury! It's one of my favorite school subjects, and I look forward to it every day. The courses are fun and not boring. It has matching, sentence reading, a conversation station and one of my personal favorites, sending a letter to my pen pal. Each lesson is on a certain topic like items around the house. Middlebury makes it very easy to remember the Spanish I have been learning. Members of the Schoolhouse Review Crew used other grades and languages from Middlebury, so don't forget to stop over there and read other reviews.